Years ago, I read a book called Go Ask Alice. You've probably already heard of (and maybe read) Go Ask Alice, which was originally published as an anonymous diary of an actual teen runaway and drug addict. Go Ask Alice isn't a perfect piece of literature, but it is still in publication nearly 50 years after its first publication in 1971. It highlights how a normal teen girl from the suburbs could succumb so easily to a life of addiction. Today, talk shows and news articles are full of stories of "normal" suburban teens falling victim to drugs like opioids and heroin. Bad Romance reminds me a little of Go Ask Alice. Both are cautionary tales, one about drugs and one about dating abuse. I think both are important reads for all high school students. Grace could be any girl, anywhere. It's easy to see why she falls hard for Gavin and ignores her friends' warnings and her own inner voice telling her that Gavin's behavior is at best, inappropriate, and at worst, controlling and dangerous. SUMMARY: Seventeen-year old Grace lives with her clean-obsessed mother and her overbearing stepfather. Grace's life isn't easy, and she can't wait to graduate attend NYU's theatre arts program. Enter Gavin. Gavin is a rock star at school, and his local band is taking off as well. Gavin adores Grace, and everything seems perfect...for a little while. But Gavin is becoming increasingly controlling Grace's every move. Grace needs to get out of this toxic relationship, before it is too late. REVIEW: So seriously important, this book. I loved everything about it: Grace's voice, Gavin's slow-burning obsession, Grace's messed up family that seems so normal on the surface. Love love love. 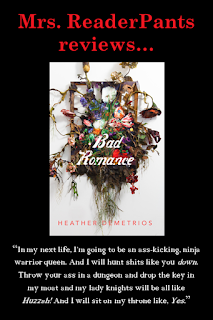 Author Heather Demetrios chose to have Grace tell her story after the events happened, which really helps underscore the early warning signs Grace chose to ignore and Gavin's slow change from loving boyfriend to possessive psychopath. We are able to see Gavin through two Grace lenses: the Grace in love with Gavin and the Grace terrified of/for Gavin. Grace also talks directly to Gavin in the story, saying things like "You opened your eyes and looked right at me" or "You never liked when I did that." This is also a great choice because it shows that Grace puts Gavin's unacceptable behavior on Gavin. She's not hiding and blaming herself for his actions; Grace confronts Gavin by telling this story and addressing Gavin as "you." Bad Romance would be a great choice for reluctant high schoolers who have a tough time getting into books. Reading Grace's voice is like listening to a friend tell a story. It's easy to get sucked in and difficult to put it down. I think this is must-read material for all high school girls and boys. This book will help both sexes recognize (and act on) the warning signs Grace constantly pushes aside. Both sexes need to understand that good, normal boyfriends and girlfriends do not fly into a jealous rage and storm off or threaten suicide every time things don't go their way. This book also made me extra-appreciate my normal, sweet and loving parents. Grace's mother is a real piece of work. I wanted to reach into the book and slap her. A lot. That SAT test scene was just...wow. Grace's mother's relationship with Grace's stepfather Roy ("The Giant") gives Grace a glimpse into what life might be like after a few years married to Gavin. I would be interested to hear Grace's half-brother Sam's story when he gets to be sixteen. Grace at least is nearing adulthood, but poor Sam has to live with these two wackos for another fifteen or so years. Will he grow up to be an abusive boyfriend like his father? Don't forget to read the author's note at the end, where Heather Demetrios tells readers about her own abusive relationship in high school. No wonder this story is so real. THE BOTTOM LINE: An eye-opener and a must for every high school library. I think all high school students of both sexes need to read this book before they start dating. It's a great story, and it might help teens determine if they themselves are also dating a Gavin or Gavinette. STATUS IN MY LIBRARY: On-order, and I've already talked this up with my high schoolers and encouraged both boys and girls to read it. It's possible I may need multiple copies.